Last year, my daughter had a very special birthday celebration: her bat mitzvah was on her 13th birthday. I didn't want to conflate her birthday with the big event, so we didn't have a cake at the bat mitzvah party. But I couldn't miss an opportunity for a birthday cake! 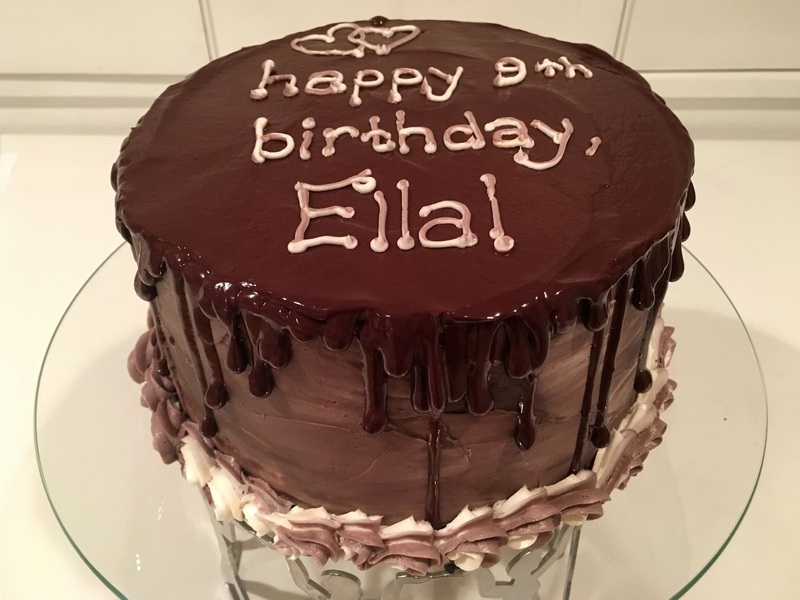 So at our Friday night dinner with family and out-of-towners, I made her a marble cake with white chocolate ganache drip (drip cakes have been all the rage! ), crazy amounts of sprinkles, and purple "unicorn bark". It was actually very cute, and it fed all 50 of our guests. I am not a fan of white chocolate, but it's the only way to do a tinted drip coating (you can't easily tint chocolate!). Although I followed the ganache directions hoping for the right thickness, it was way too runny and more transparent than I envisioned. See how it pooled at the bottom? That was after I had added more white chocolate! Oh well. Still cute. For my niece's 9th birthday, my daughter planned a surprise party for her cousin, and it was fun to make a beautiful cake as part of the surprise. Plus, it gave me a second chance to make a drip cake. I felt more comfortable adjusting the thickness of chocolate ganache, so it was easier get the drips just right. It's hard to tell from the color of the picture, but the cake is frosted in a mixture of purple and white.